West System G/flex is a tough, resilient epoxy engineered for a superior grip to metals, plastics, glass, masonry, fiberglass, and wet and difficult-to bond woods. G/flex is easy to use with a simple 1:1 mix ratio. It has a long open working time of 45 minutes at room temperature. G/flex reaches a working cure in 7-10 hours and a full cure in 24 hours. Toughness and Flexibility G/flex has been toughened. This gives G/flex the ability to make structural bonds that can absorb the stresses of expansion, contraction, shock, and vibration. G/flex is resilient and impact resistant. With a modulus of elasticity of 150,000 psi (WEST SYSTEM 105 Resin/205 Hardener has a modulus of elasticity of 450,000 psi), G/flex is more flexible and can deflect further than WEST SYSTEM 105/205, while being much stiffer than typical adhesive sealants. Bonds to wet and damp surfaces G/flex has the ability to glue damp woods. It can be used on wet surfaces, even underwater when applied with specific techniques. Excellent adhesion to hard-to-bond woods G/flex adheres tenaciously to difficult-to-glue hardwoods, both tropical and domestic varieties. This is important since many of the exotic and tropical species now being used to replace traditional woods present bonding challenges. Bonds well to a variety of materials G/flex is ideal for bonding a variety of materials, including dissimilar ones. G/flex has a superior grip so that it can be used to bond to metals, plastics, glass, masonry, and fiberglass. G/flex is ideal for repairs to aluminum boats and polyethylene and ABS canoes and kayaks. It can also be used to wet out and bond fiberglass tapes and fabrics. Ease of use G/flex is a simple two-part epoxy system. Resin and hardener are mixed in a 1:1 mix ratio by volume. For added convenience, a pre-thickened version, G/flex 655 Thickened Epoxy Adhesive, is also available. G/flex provides a relatively long open working time of 45 minutes. It cures in 7-10 hours and can be used in cool temperatures. 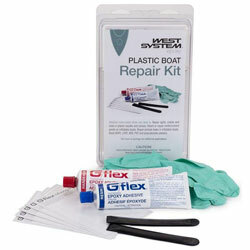 Because it is simple to mix and use, G/flex is an excellent starting point for customers new to epoxy use. Versatility G/flex can be modified with WEST SYSTEM fillers and additives if you need to meet particular bonding needs. Adding G/flex to other WEST SYSTEM epoxies can improve their toughness and flexibility.